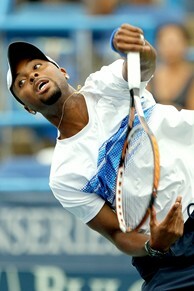 Donald Young took the victory over Austria's Jurgen Melzer after Melzer succumbed to injury during a rain delay. WASHINGTON (AP) - About 1½ years after Australian customs officers caught him with eight vials of human growth hormone, Wayne Odesnik played his first ATP main-draw match since returning from suspension. The American lost 6-1, 6-1 to 54th-ranked Radek Stepanek of the Czech Republic at the Legg Mason Tennis Classic on Wednesday. Odesnik held serve in the opening game, then - after a rain delay of nearly two hours - dropped the next 11 games in a row at the hard-court tuneup for the U.S. Open. Afterward, he didn't want to discuss details of his case involving the banned performance-enhancing HGH or react to other players' negative reactions to his being back on tour. "I'm just trying to move on with my career, with my life, put it behind me the best that I can, and that's it," Odesnik said. "If they have negative things to say, that's them. I'm not going to sit here and bad-mouth anyone. ... They don't matter to me." Saying he has no regrets, Odesnik summed up the past 18 months this way: "It's rejuvenated my career, because I'm a lot hungrier." Donald Young of the United States advanced under unusual circumstances Wednesday: His opponent, No. 4-seeded Jurgen Melzer, decided to stop playing while their match was in a third-set rain delay. Melzer said he was bothered by a pulled left leg muscle. And Young's third-round foe, Michael Russell of the United States, moved on when No. 14 Xavier Malisse quit because of a right arm injury. The exits by Melzer and Malisse add to withdrawals by players who cited injuries in pulling out before contesting a point in the tournament: Mardy Fish, Andy Roddick and Fernando Gonzalez. In the only other match that was completed before late-day showers interrupted play again and led to the postponement of six singles matches, No. 9 Nikolay Davydenko beat Matthew Ebden of Australia 6-3, 7-5. Action resumed after 10:30 p.m., following a delay of more than three hours, and in a pair of matches that finished after midnight, No. 3-seeded Viktor Troicki beat 19-year-old American Ryan Harrison 7-5, 6-2, while No. 5-seeded Fernando Verdasco defeated qualifier Marinko Matosevic 6-4, 6-4. Because of the backlog created by the rain, tournament organizers scheduled Thursday's play to begin at noon, four hours earlier than originally planned. Before Odesnik stepped on tiny Court 2 - there were about a half-dozen spectators on the dark green wooden benches when he walked out to warm up - he hadn't played at this level since April 10, 2010, when he lost in the semifinals at Houston. By then, he already pleaded guilty in an Australian court to importing HGH in January 2010 and was fined less than $10,000, but his tennis punishment was still up in the air. Nine days after that match in Houston, Odesnik - who denied using HGH and never tested positive for it - accepted what the International Tennis Federation called a "voluntary provisional suspension." Then, in May 2010, he was banned for two years, with the punishment backdated to December 2009. And in December 2010, that two-year suspension was cut in half because the ITF said Odesnik cooperated with its anti-doping program. The group's rules say that an athlete's ban can be shortened when "the participant has provided substantial assistance" in uncovering other offenses. The ITF did not reveal how Odesnik helped - and he made a passing reference Wednesday to "things ... I'm not entitled to tell." Odesnik, once ranked as high as 77th and currently 161st, returned to the sport this season at the bottom, forced to qualify for tournaments on the Futures circuit, the lowest rung of U.S. Tennis Association professional events. After earning ranking points that way, he moved up to the still-minor Challenger circuit. He tried to qualify for the Legg Mason tournament but lost. When second-seeded Mardy Fish withdrew, though, that allowed Odesnik to get into the field - and he even slid right into Fish's spot in the bracket, which came with a first-round bye. "A couple of years ago, I would have been a little bit more devastated about the loss," the 25-year-old Odesnik said. "But it's my first ATP event in almost a year and a half. I didn't expect to get in, anyway, so I'll go home with a little bit of money in my pocket, and I'll go on to my next tournament." Stepanek said he hadn't followed the ins and outs of Odesnik's case, but heard plenty from other players in the locker room before Wednesday's match. "I just wanted to beat him. For me, it didn't matter what his past was," Stepanek said. "It's not fair, definitely, what he's done, but that's his life," he added. "He's wasting his life in this, and that's what he has to live with." It took all of 57 minutes for Stepanek to wrap up the victory, as he dominated with his net-charging and volleying, but also fared better on lengthy baseline exchanges. Asked to assess where Odesnik's game is now, Stepanek said: "It's tough for me to say where he is." Odesnik was born in South Africa and moved to the United States as a child. He turned pro in 2004 and is something of a journeyman, with a 32-43 career record in tour-level matches and zero ATP titles. Odesnik reached one ATP final, and the highlight of his Grand Slam career was reaching the third round at the French Open in 2008. When he sat in a burgundy chair for his postmatch news conference Wednesday, Odesnik scanned the gathered reporters and said: "There's definitely more of you now than a couple years ago." He paused, then broke into a smile and added: "Who said bad publicity isn't good publicity?"